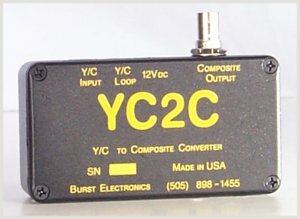 The YC2C converter accepts a Y/C input and outputs a composite video 1 Volt standard signal. The format of the input is of the S-VHS or Hi8 type. Works in both NTSC and PAL. The YC2C is 12 Vdc powered, wall module included.